The first quilt along I joined was a Christmas quilt hosted by Partners in Design. I also made a few of the blocks they had in last year’s fall quilt along. These quilt alongs gave me the opportunity to try new things. 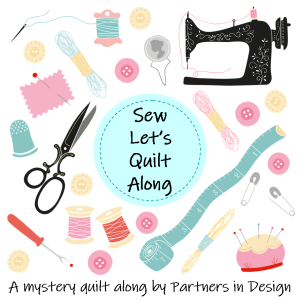 This year, the theme for the quilt along is sewing. I had been looking online for some sewing machine quilt block designs. I have also been purchasing sewing themed fabric, with no real plan in mind. So, when I saw that this new quilt along was beginning on March 12, I decided to try it out. I may just end up making a “sewing” quilt for me.Although, this year, they will be offering ideas for using these blocks in small projects. Abbie, of Sparkle On!, is a host of the small projects. I am looking forward to seeing her ideas. Today’s block was designed by Sandra Healy. She provides great directions. All of the other designers, offer great tips as to how to complete the block. I am finding difficulty with precision. I double check my cutting and my quarter inch seams. I measure each section as I complete it. But I still find that I am a bit off in final measurements. I noticed that I am not pressing correctly. I still tend to mash and distort the fabric. I also noticed that as I sew, I sometimes stretch and distort the fabric. I especially have trouble when piecing smaller pieces, as required in this sewing machine block. I am just a bit off of the final measurement of the block. I need to be more diligent with this. Any suggestions or tips on how to improve on precision are appreciated. I still need to embroider the thread running through the machine; and embroider the tops and bottoms of the thread spools.